February 9th, 2018 – British consumers continue to invest in experiences over material goods, as new data shows sentimental spending has increased by 11% since 2015, with the number of transactions up by 23% during the Valentine’s Day period. The annual “Mastercard Love Index”, which analyses credit, debit and prepaid transactions during the Valentine’s period, reveals that dining out represents 25% share of spend in the UK, and 60% share of transactions in 2017. Romantic getaways via air or train rose significantly as the number of transactions increased by 31% in 2017, accounting for 19% of total spend. Hotel stays represented 38% share of spend. Conversely, money spent on traditional Valentine’s gifts such as flowers decreased by 22%, and the number of transactions has decreased by 8%. Similarly with jewellery, spend decreased by 32% and transactions decreased by 12% (vs. 2015). The study, which looked at shopper behaviour in more than 200 territories around the globe, identified further purchasing trends. The trend for online shopping continues with an enormous 169% increase in the number of e-commerce transactions from Valentine’s Day 2015 to Valentine’s Day 2017. 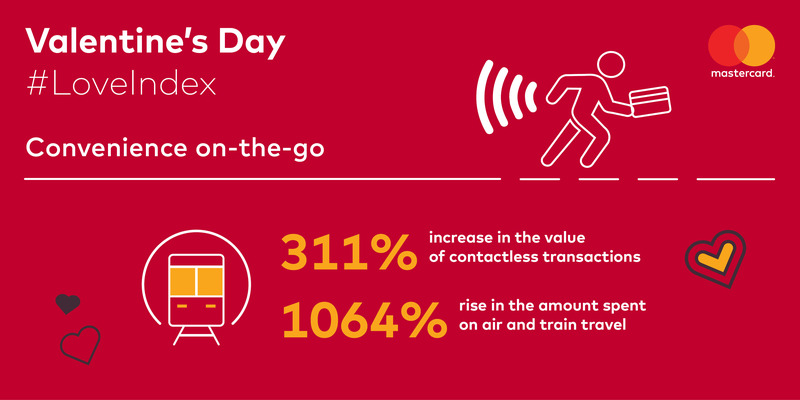 The Mastercard Love Index – now in its third year – highlights global and regional trends to offer retailers insight into consumer buying habits over the Valentine’s period, by analysing credit, debit and prepaid transactions. The data takes into account spending over the last three Valentine’s periods from 11th to 14th February 2015-2017.